I have a request for my biscuit recipe. I want everyone to be able to make stellar biscuits and I hope you'll try this recipe. Heat oven to 425˚. If you have cast iron skillets, put about a tablespoon of shortening each in 3 10-inch skillets and place in the oven to heat while preparing the dough. I use a 10 1/2-inch, an 8 1/2-inch, and a 6-inch skillet because that's what I have. If you don't have any cast iron skillets, grease a large cookie sheet and set aside. Or, use the cast iron skillet and a cookie sheet if you haven't enough skillets. Sift flour, baking powder, salt, and sugar together. Cut in shortening until mixture is like coarse corn meal (if some pea-size chunks remain, that's okay). Add milk, stirring it in quickly with a fork, to form a soft dough. (If a large portion of the dough is still crumbly and not dough-like, add a tablespoon or so more of milk. Turn dough out onto lightly-floured surface; knead about 1/2 minute. Roll 1/2 inch thick, or slightly taller (Update: To get the height you might want to pat the dough out to about 3/4" or even 1". Also, baking them close together sort of helps them "grab hold" of something and bake up instead of out. ); cut with 2-inch cutter dipped in flour (I use both a 2-inch and a 1 1/2-inch cutter). Place fairly close together in the skillets or on the cookie sheet (about 1/4" apart) (you can also brush the tops with melted butter if you like) bake about 12 minutes. Serve hot. ohhhhh...those are beautiful. What a centerpiece of a meal that would be. By the way, how's your legs feeling now that you have started to run again. I know how it feels, it's a pain to run and it's a pain not being able to run. It's a never ending cycle with me. It's a mix of excitement and paranoia, truthfully. I'm happy to be running, but I never I'm constantly "looking over my shoulder" because I'm worried I'll re-injure myself. There are some dull throbs a few hours after my run, which I think are just because I'm getting used to using a muscle that's been relatively dormant. How did your injury start? I'm sorry it's not going well, I can really empathize with you because I lived/am living through it. did you use smart balance shortening, or the butter spread thing? 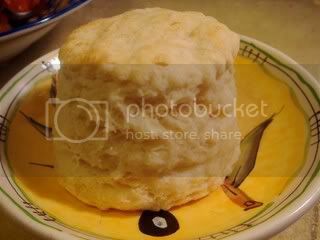 i'm looking for a biscuit recipe for thanksgiving but it's gotta be a vegetarian one (i.e., no lard). i'm going to be doing test runs on recipes this year so i'm not winging it. I used Smart Balance shortening, which is different than the butter spread. As for the milk (if you can't use milk), just try soy milk. I'm guessing you knew that, though! I've never tried it so I would hope it works. I guess just cut the recipe in half so if it doesn't come out right, you won't have made the entire batch. Oh, I've made this also by replacing 1/4 to 1/2 of the flour with whole wheat flour and it tasted good. It did change the texture and it wasn't quite as flaky as normally, though. I just tried them and they were great even if they didn't rise as high as yours did.